I dreamt up these cupcakes ages ago and it is about time that I finally made them. It should be pretty obvious that these are inspired by Neapolitan Ice Cream. 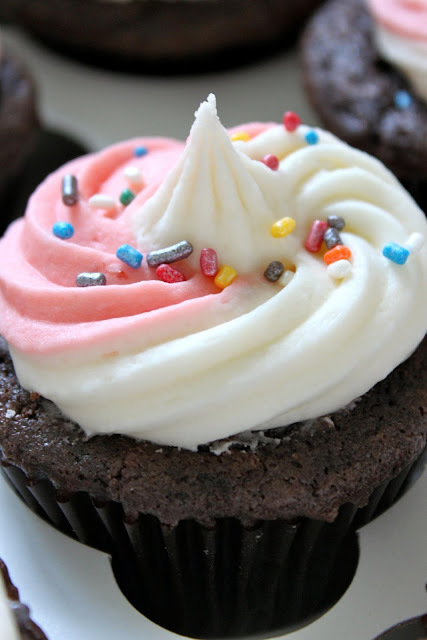 You could easily make a vanilla cupcake with chocolate and strawberry frosting or even a strawberry cupcake with chocolate and vanilla frosting. I made these for our neighborhood block party and they were a hit. As expected, the kids loved the colors and sprinkles, but they were just as popular with the adults. To pipe as pictured, place vanilla frosting and strawbr frosting in separate piping bags. 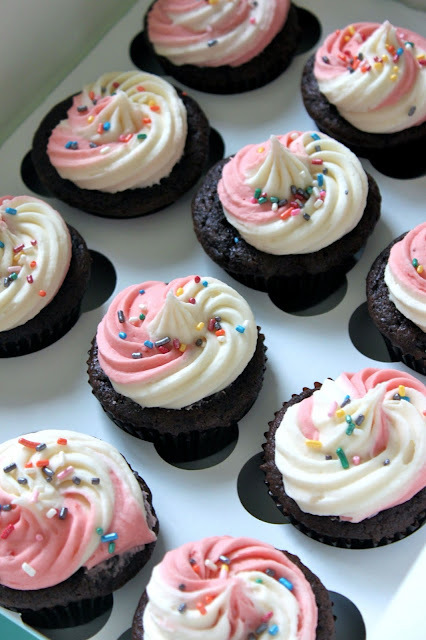 Place the two piping bags filled with frosting into a larger piping bag. Squeeze gently until both frostings are piping at once.